After most of the crowds have gone home, the evening allows for a unique way to explore the mountaintop trails as well as the night sky. If you’ve ever tried hiking at night, you’ll know that it’s not for the faint of heart. Every little sound or motion emits instant thoughts of “bear!” or “cougar!” or even “serial killer!” depending on your current Netflix browsing history. 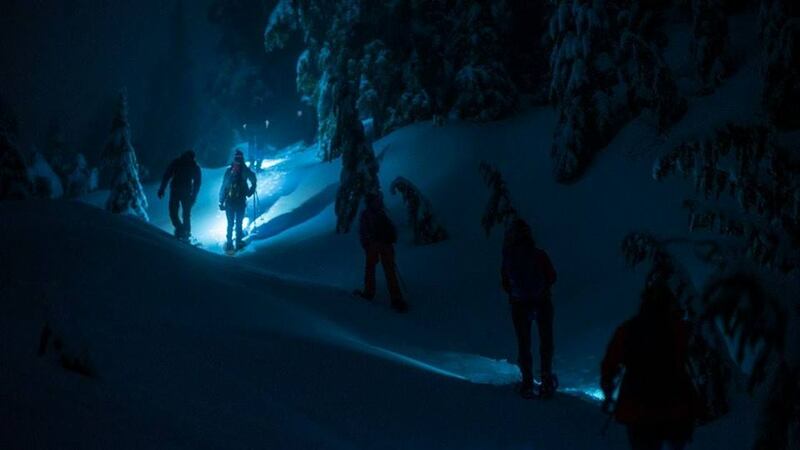 However, what’s great about the Grouse Mountain after dark snowshoe tours is that you’ll be safe wandering with a group. Led by a knowledgeable snowshoe guide, you’ll be taken on a journey to their favourite places to explore the night sky. The tour starts out in the incredible (and Instagram-friendly) Light Walk, before heading into the wilderness lit only by headlamps. With a balance of twinkling city views and mountain wilderness, there’s no doubt that you’ll have a lasting memory in the mountains. Grouse Mountain offers two tour types: Full Moon and New Moon tours. The Full Moon Tours run on Wednesday, March 20, 2019, and Friday, April 19, 2019. During these tours, the moon will be at its biggest and brightest. The next New Moon Tour will be held on Friday, April 5, 2019. Opposite from the Full Moon Tours, these tours focus on the minimal glow from the moon, allowing for some incredible star gazing opportunities. These snowshoe tours are a great evening activity for bonding with friends, first dates, or families (although participants must be 16+). The tours run from 7:30pm – 10:00pm and cost $25 (+ the price of a skyride ticket). Tickets are available for purchase online. If you don’t have a pair of snowshoes or microspikes, you can also rent a pair for $10. Headlamps are included. More information is available on the Grouse Mountain website.